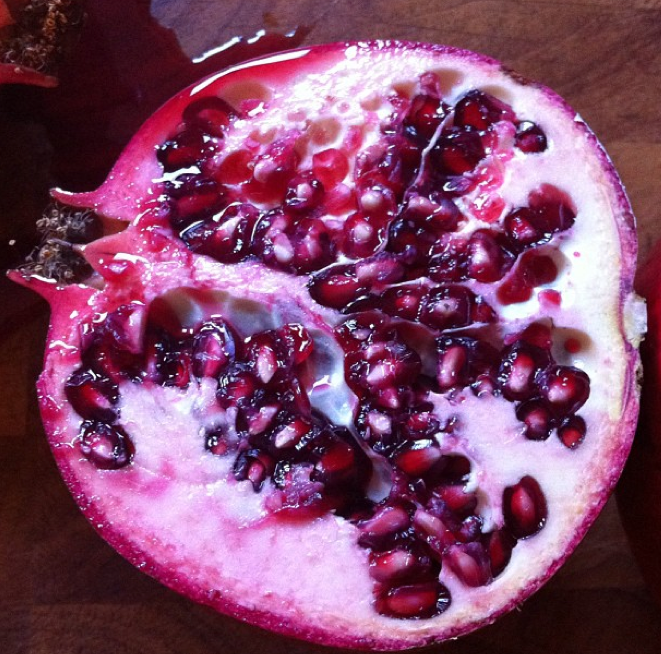 Pomegranates are here. And so is my reluctance to buy them and take the time to extract the delicious seeds (arils). Lazy, yes. 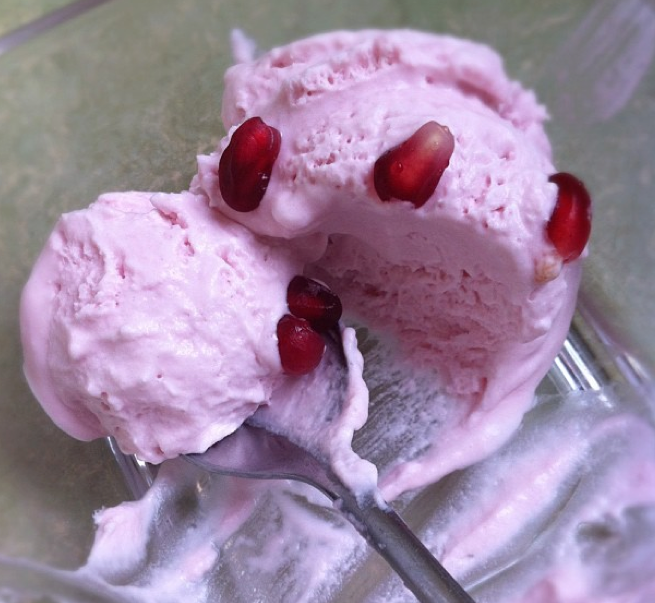 But then I was inspired to take the healthy pomegranate and fatten it up into a simple and delicious, no-churn ice cream. (Using a recipe from Nigella Lawson‘s cookbook Nigella Express.) 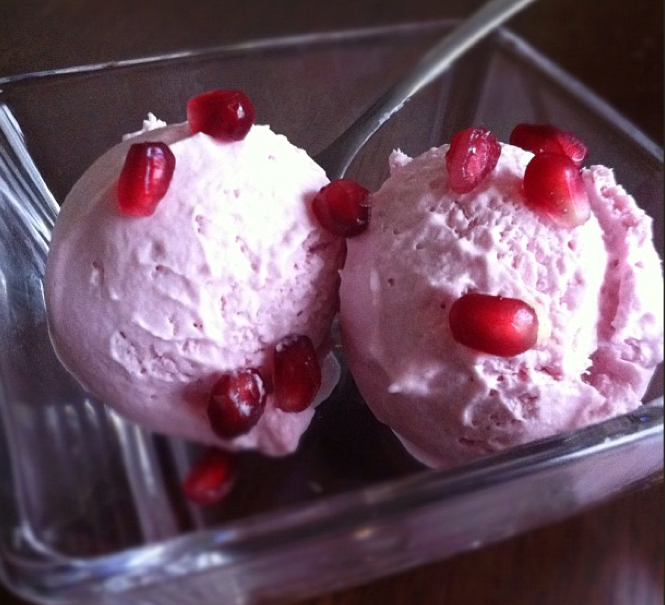 Who other than Nigella could completely kill the heart-healthy attributes of a pomegranate with 2 cups of whole cream? Screw sprinkling the arils on a salad, I latched onto her bandwagon fast. 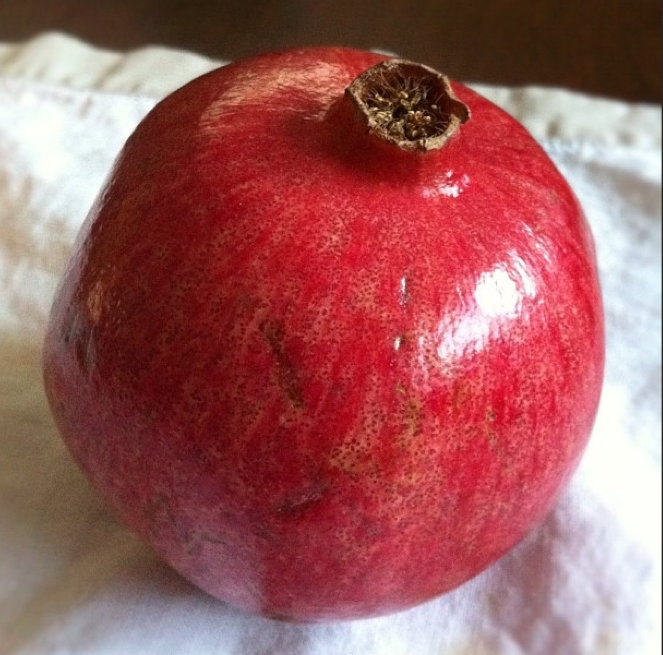 Take the pomegranate and halve, then quarter. (cut off the crown and score the outer skin with your knife and pull apart). Now take the pieces and in a bowl of cold water, submerge one at a time and gently pop out the seeds with your hands. No squirting juice to deal with and the heavier seeds will sink to the bottom while the pith floats on top. (Bit of a blood bath, isn’t it.) 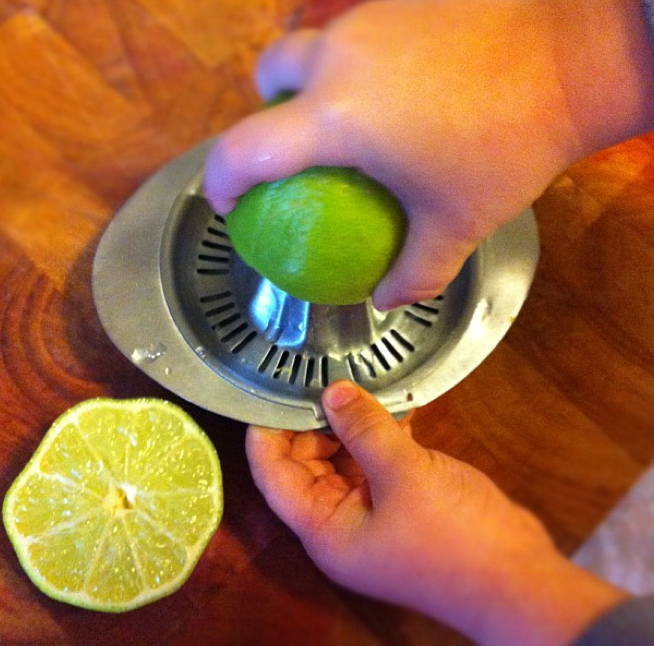 Now you can scoop of the pith and drain the seeds. 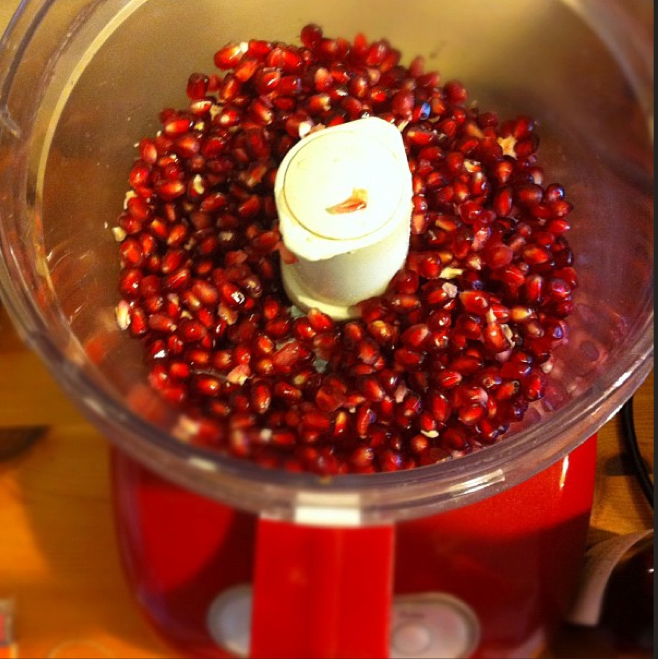 Next, to juice, into the food processor they go. 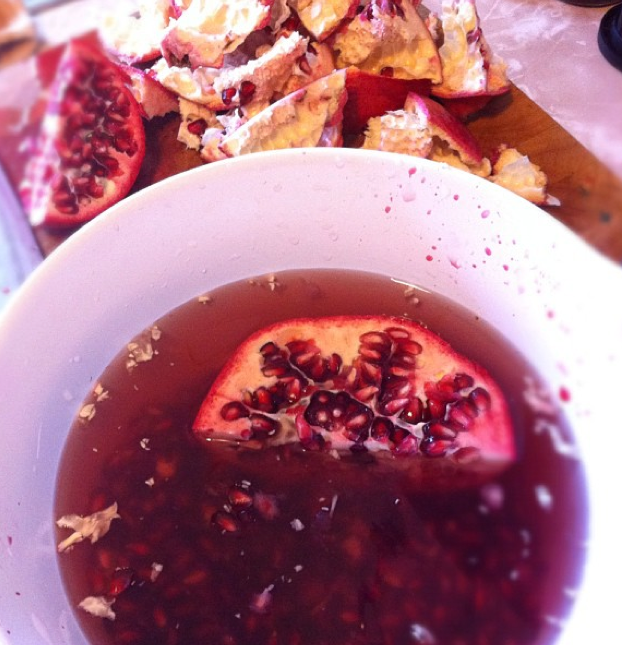 For the recipe, you need to de-seed 2 pomegranates and just buzz them for a few seconds –then drain through a fine sieve. You need 3/4 cups juice for the ice cream but I got about 1 cup. (You will never buy a POM drink again after you taste this). Total unneccessary picture but how cute are Felix’s little hands! 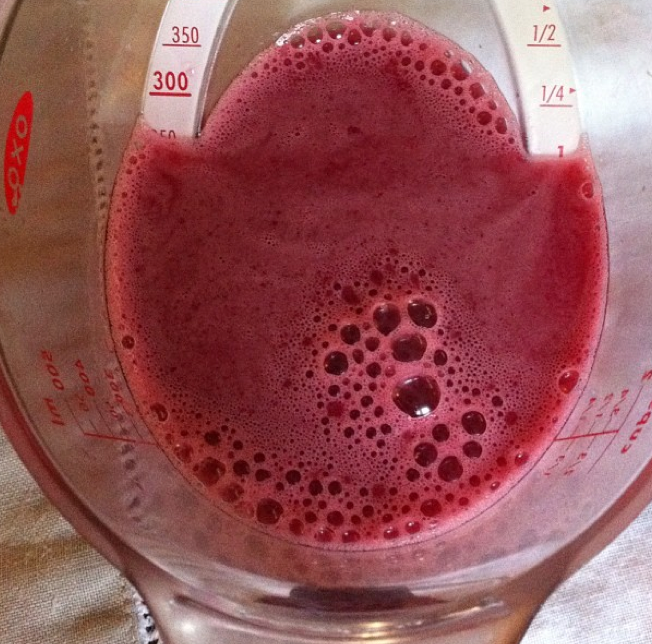 Add the lime juice to the pom juice and put it into a medium size bowl. Add 1 1/2 cups icing sugar. (I was a little leery of the amount of sugar but the balance of flavour was good in the end.) Then add in the 2 cups whipping cream. And well, whip it, whip it good! 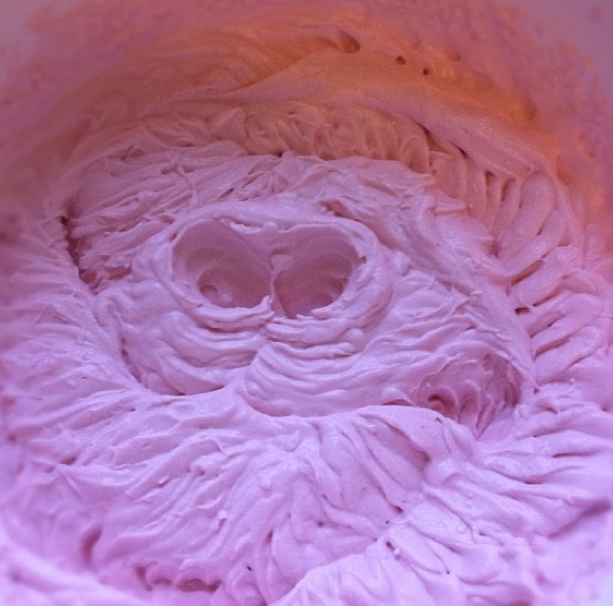 It will be light and fluffy and a very very pretty. Beware of how much you “taste” at this point. It’s crazy delicious. Sweet, rich and yet a little tart from the fruit. 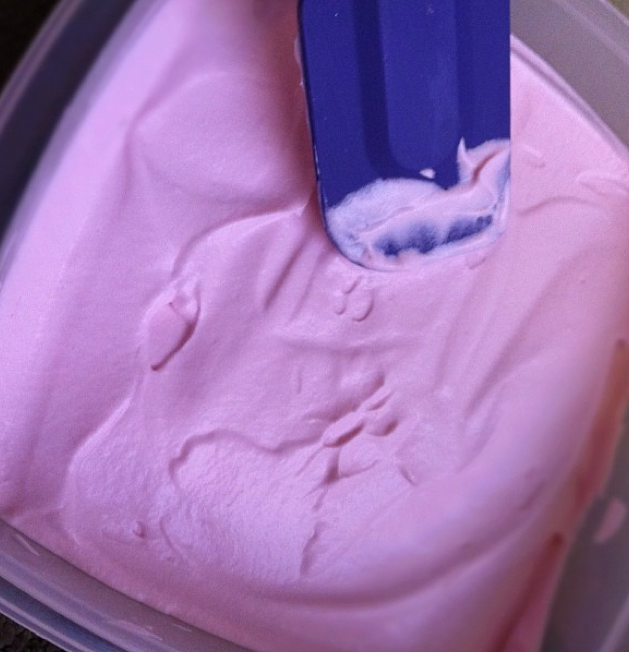 Spread it into a Tupperware and put on lid, then straight into the freezer. Ultimately, I left it overnight before serving, Nigella says four hours in minimum. Was still a bit soft at four hours in my freezer. So good I ate it for breakfast. (Never skip breakfast, bad for your health) . This whipped ice cream softens fairly quickly so does not have the denser texture of a typical custard based, churned ice cream, but I think it would make a gorgeous finish to a meal if you were entertaining. It’s really light and creamy, and so easy to do in advance. For myself, I know how I’ll be getting my daily servings of dairy this week. I have been using the excuse that I need calcium for my broken elbow, hence the gallon of Ben & Jerry’s.